New Cool Thang » When will the Millennials take over the Quorum of the 12 and First Presidency of the church? Anyway, taking a base snapshot of the generational drift of the apostles by decade, I get the following. 1. What are the implications of the Q15 becoming predominantly baby boomer run over the next 10 years? Do you expect the cultural and social differences between the silent generation and baby boomers to have an impact on the way the church is run? 2. 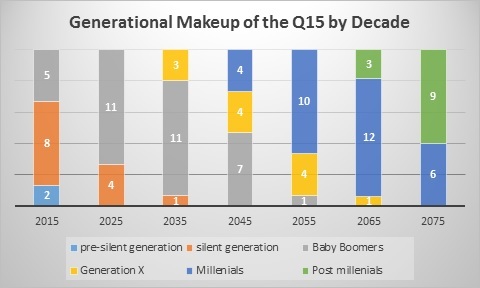 What are the implications of the Q15 becoming predominantly millennial run over the next 50 years? Do you expect the cultural and social differences between the silent generation and millennials to have an impact on the way the church is run? 3. Do social and cultural changes have a place in divinely run institutions and in our theological understanding of revelation? *- I openly acknowledge that the median age of apostle called has drifted from 52 between 1960 and 1970 to 62 between 2005 and 2015. This implies the possibility of drift to age 70 by the year 2060. I did not include this in my calculations.The implication would be a few more gen x and a few less millennials, but otherwise the model holds up. Spelling of Millennials corrected in the title. Thanks Amy. Between 1970 and 1990 the % of stay at home moms went from 44% to 25%. 1970 is the year women started going to college in mass. Between 1970 and today the % of female dentists went from 1% to 30%. In terms of Gay Marriage, there is a 30 point difference between the silent generation and millennials. I was trying to figure out why you had to go back 11 apostles to get to Pres. Hinckley, since there have been just five apostles called since he died, and therefore just four who have died after Pres. Hinckley died. And then I looked at the list again, and see that of all the men called to the apostleship since Pres. Hinckley was called in 1961, 10 have died. Which makes Pres. Hinckley the 11th. There are at least 4 different “churches” involved. There is the church as top leadership, there is the church professional bureaucracy, there is the ward and stake leadership and there is the membership. The top leadership is the oldest, the bureaucracy and local leadership are similar age but more diverse in make-up and the membership is the youngest but the greatest range in what makes up an “active” member. This is also made more complex because of the great degree of self-selection in which members have remained in the church. It is hardly a random sample of generations. The migration of conservative boomers from the coasts back to the intermountain area and the out- migration of intermountain members to politically conservative areas such as Virginia and Texas play a big role also. As the judiciary and presidential politicians in the USA, become less white and conservative, I think the millennial bishops will be significantly more used to being at war with the general trend. Mormonism will return to its roots as having an even stronger identification as a persecuted minority. in the most politically liberal areas, the younger people who have migrated in tend to be more conservative than the older people who have lived in the area for longer periods. Bishops and stake presidents who have jobs that require politically neutral or liberal positions (education or the the arts, for example, will be the most in the hot seat). Interesting–thanks for the analysis. This raises a question for me: How do other countries’ “generations” match up with the US? As the Q15 becomes less US-centric (we assume and hope) in the coming years, that could impact the balance, no? With baby boomers as apostles, Beatles lyrics will replace Broadway tunes in conference talks. Now and then Paul Simon’s words will be repeated, and Bob Dylan’s on rare occasions. This assumes life expectancies will not continue to increase, which is highly unlikely. Ray Kurzweil predicts we will reach escape velocity of life expectancy (the point at which life expectancy increases faster than real-time) in about two decades. Stevenson was born in 1955. Since apostles are called by revelation, a millennial could be called to the Q12 anytime. I’d second what Lemuel said. I’ve thought that with people living longer we might start getting some younger apostles. I’m really curious about how the quorum will evolve in the future including perhaps emeritus status for those too ill to perform their duties. An awful lot is demanded of them. Far more than was demanded of them in the past as the church has continued to grow. John, then comes the Gen-Xers any day now. And we’ll get U2, Nirvana and Radiohead. Clark, there was a time when that was done. They were called Assistance to the Q of the 12, and were in some ways a mentor system. There might be a few still alive in the Q of the 12 who were in those positions. I believe that would be brought back before emeritus status. I think that as we see Millennials and others join the Q15, they will have been vetted by the Lord through years of faithful service, just as we see with those chosen today. You’ll note that stances on doctrine do not change, only policies based on tradition. So, we see no change on women ordination or gay marriage, but we see a change in women’s involvement in councils and our change in kind treatment towards gays and others we disagree with. True, core doctrine will not change. Calling older men into the Q15 helps to ensure we do not have radical change done for the sake of social justice. 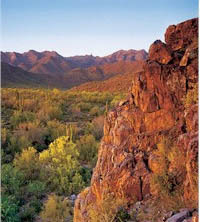 Instead, it ensures changes occur at the behest of God. We will see interesting cultural changes occur and new stories as people of other cultures and nations join the Q15 and general auxiliary presidencies. Pres Uchtdorf’s childhood talks are very different than Pres Monson’s, who never had to escape Nazism or Soviet Germany. The newer generation is helping us to clarify some doctrines. Our concepts on Grace are now different from those taught by Joseph Fielding Smith, thanks to Elders Holland and Uchtdorf. Any chance you’re a middle-aged white heterosexual male? If so, it would be the most typical demographic to claim a “we” in that curious statement. Rameumptom. I think our terminological use of “grace” has shifted. I’m far from convinced the concepts of our theology have really shifted. “We” meaning the mainstream Church and its leaders. I don’t see it as a curious statement for any member that is firmly behind the GAs. Also, most members in other countries (non-white) are very conservative and would agree with me. Clark, I understand your position on this. However, for those of us growing up in the 1970s and before, we felt like we had to earn our way to heaven, and grace was mostly about a free resurrection. Our Core doctrines have not changed, but they are influenced by a lot of secondary concepts that shape how we understand them and practice them in our life. It is possible that the Lord could be preparing a generational shift for the very purpose of progressing his faith to greater understanding and revelation. Sorry if the snippet about “the gays” distracted anyone from my central point. Unless I missed something, I did not sustain any random blog or newspaper commenter as a prophet, seer, and revelator, so the use of prophetic voice in a blog comment is a big red flag. Did you know, rameumpton, that you were using the prophetic voice in your statements about women, church councils, homosexuality in the Church, how we develop and teach doctrine, etc.? Any statements cloaked in prophetic voice, and especially statements of cultural superiority are, or should be, deeply suspicious to members of the Church. It is precisely because I sustain the leaders of the Church and take their responsibilities and pronouncements so seriously that I found your statement troubling. None of this is to deny that especially in mid-century Mormonism there was so much emphasis of doing more that people got burnt out. I’m just not sure that’s a issue of grace. I’d note that is a problem for many conservative strains of protestantism which tended to adopt the more Lutheran conception of grace. Matt, even in most of those it was usually a few GAs who thought they were important versus others who didn’t. Also on some of those, I don’t think the rhetoric has shifted much at all. (Heavenly Mother, use of the word grace, etc.) Certainly some things have shifted such as implementation details on the temple rites. And a lot of teaching on blacks was jettisoned (although it took longer to get rid of it all than it should have). So I think things are a tad more complex than your list suggests. Let’s just hope that if they call a Millennial that said Millennial will finally have a job and will have moved out from living with mom and dad before the call is actually issued.